New York, 24 September 2018 – United Nations Member States, private sector and civil society today joined Secretary-General António Guterres’ call to enhance the role of the world’s 1.8 billion young people in driving global efforts to promote a peaceful, just and sustainable world. Youth 2030: The United Nations Youth Strategy, launched today by Mr. Guterres at a high-level event of the 73rd session of the General Assembly, seeks to strengthen and increase commitments at the global, regional and national level to meet young people’s needs, help them realize their rights, and recognize their positive contributions as agents of change. Commitments to the Youth Strategy were voiced throughout the event, with Denmark being the first partner to make a direct financial contribution towards its implementation. ”If we want real change for the better, we need to ensure development not just for young people – but with and by young people” said H.E. Lars Løkke Rasmussen, Prime Minister of Denmark, as he spoke alongside Denmark’s Youth Delegate. Similarly, Mr. Sultan AlMusallam of the Misk Foundation spoke out in support of the Strategy. Tomorrow, the Foundation will sign a partnership with the Office of the United Nations Secretary-General’s Envoy on Youth making it the first non-government organization to make a concrete pledge to Youth 2030. While this is the largest and most connected, tech-savvy generation the world has ever known, young people face tremendous challenges. Too many do not have access to a quality education and struggle to secure decent work. Many lack adequate health care, including for sexual and reproductive health. There are few opportunities to participate in decisions that can determine the course of their lives. Youth 2030: The United Nations Youth Strategy, which is based on lessons learned from youth programmes around the world, stresses the need to engage young people so they can more meaningfully contribute to the work of the United Nations, and seeks to ensure the UN can benefit from their views, insights and ideas. 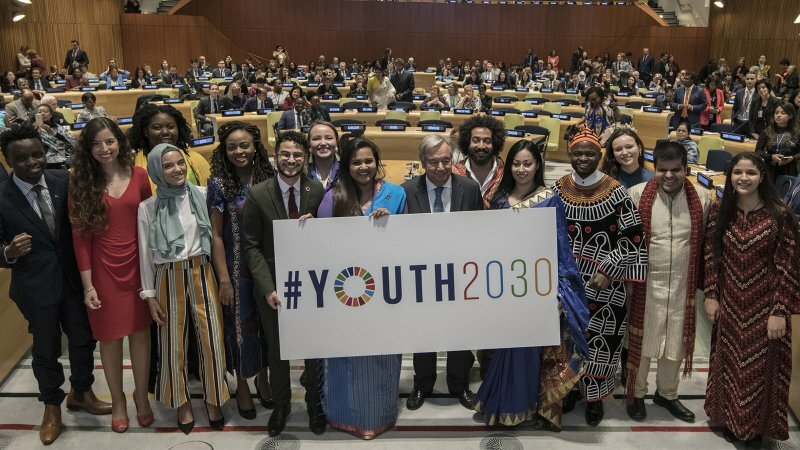 “Today marks the beginning of a reset and reorientation of the UN system’s commitment to ensure that young people are not only heard, but understood; not only engaged, but empowered; and not only supporting, but leading global, regional and national efforts to achieve the Sustainable Development Goals and build a better world for generations to come,” said Jayathma Wickramanayake, the Secretary-General’s Envoy on Youth. Jayathma Wickramanayake, the Secretary-General’s Envoy on Youth, in the SDG Media Zone just prior to the launch. The majority of the world’s 1.8 billion young people live in developing countries, and their numbers are expected to continue growing. “Being young means being ambitious, creative, determined, innovative and courageous. What else do we need to solve all the problems around us?” asked youth leader Batool Alwahdani, Vice-President of the International Federation of Medical Students’ Associations during the event. “The new UN Youth Strategy is an investment in a better future for me and my generation. It establishes all possible means to support, enable and strengthen meaningful youth participation all over the world.” Ms. Alwahdani was selected to speak at this event by her peers through a key youth platform representing thousands of youth organizations and millions of young people around the world. The strategy has five priority areas: youth engagement, participation and advocacy; ensuring informed and healthy foundations through education and health care; economic empowerment through decent work; human rights; and peace and resilience building. Delivering on Youth 2030 will require bold new approaches and partnerships. A multi-stakeholder initiative, Generation Unlimited, was also launched today to address the desperate lack of quality education, skills training and employment opportunities for young people. This partnership will bring young people together with a wide range of partners, including governments, the private sector, academia, international and civil society organizations to create, fund and scale up innovative solutions and expand opportunities. The ownership of the UN Youth Strategy is equally shared by all members of the UN system at the global, regional and national levels. The Secretary-General’s Envoy on Youth, Jayathma Wickramanayake, will be the public face of the UN Youth Strategy and will lead global advocacy efforts and its High-Level Steering Committee in support of its successful implementation. In addition to the Envoy as the Chair of the High Level Steering Committee, it will consist of Senior Leaders (ASG level) from across the UN-System whose entities’ organizational mandates relate to any of the priority areas of the Strategy, along with two youth organizations on a biennial rotational basis. The High-Level Steering Committee will seek to ensure alignment with other UN processes and the UN reform, guide effective linkages and synergies at all levels, and guide the efforts to mobilize resources and leverage partnerships in support of the strategy.